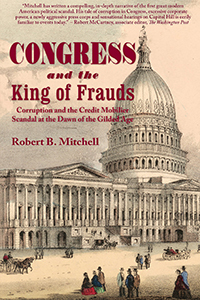 Robert B. Mitchell ’80, an editor with the Washington Post News Service, has a new book out: Congress and the King of Frauds: Corruption and the Credit Mobilier Scandal at the Dawn of the Gilded Age (Edinborough Press, 2017). The Credit Mobilier scandal rocked Washington in 1873, ruined reputations, and contributed to a massive Republican defeat in the 1874 congressional elections. It validated anxieties about corruption and concentrated economic power as the United States staggered toward industrialization.